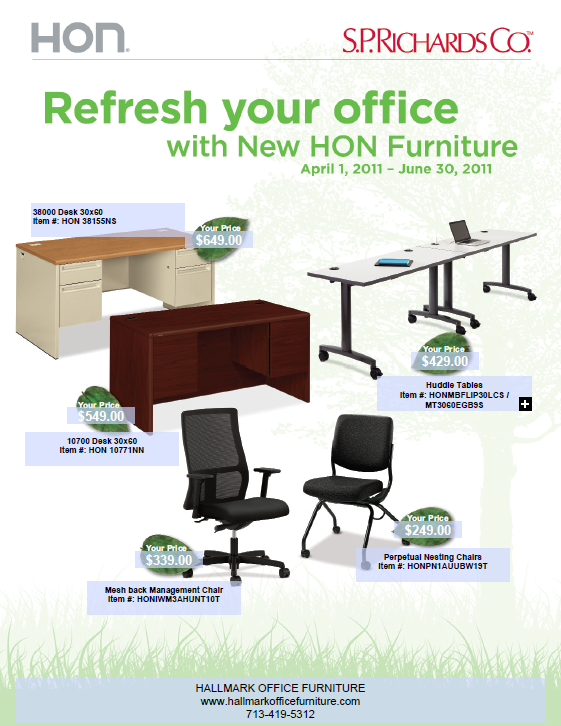 Kick start spring with Hallmark Office Furniture’s new sale on Hon Furniture! From April 1, 2011 to June 30, 2011, Hallmark is pleased to offer special discounted pricing on Hon desks, huddle tables, management chairs, and perpetual nesting chairs. Pricing starts as low as $249.00!!! For more information, contact Dan Stephens at 713.419.5312 today! This article was posted on Wednesday, April 13th, 2011 at 1:47 pm	and is filed under Specials.